Our day climbing Mt. Princeton, Prince of the Sawatch, began with dark omens. We spent the night huddled in our tent as rain played our tent like a drum. Loud enough, even, to drown the pops and crashes of Buena Vista's Independence Day firework celebration. We lay hoping that the seams of our tent and the various, pre-departure treatments of Camp Dry would hold. We set an early alarm, 4:30 am, since Princeton, with 6,000' of topographical prominence from Buena Vista, is one of the longest and most-strenuous climbs in all the Sawatch Range. Needless to say when we brought ourselves from the tent neither of us had had a worthy night's sleep. 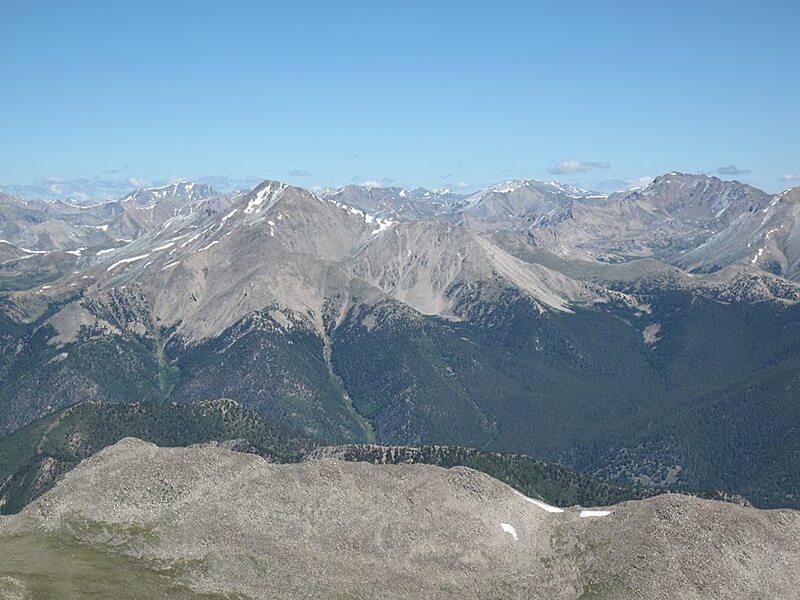 The air was crisp and the nearby mountains were frosted with a light coat of fresh, July snow. All the signs seemed to point towards a poor day for a climb. 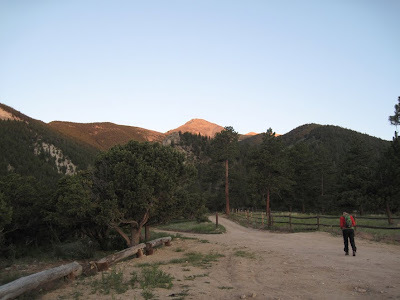 But the skies had cleared, and though we both struggled with the 4 am witching-hour blues, we had motivation enough to make our way to Princeton's popular trailhead even as the first rays of the morning sun crept above the eastern horizon. Trailhead: Princeton's trailhead is a lowly 8,900', leaving almost 5,300 vertical feet for us to ascend. We'd hoped to abridge this grueling approach by driving up the Mt. 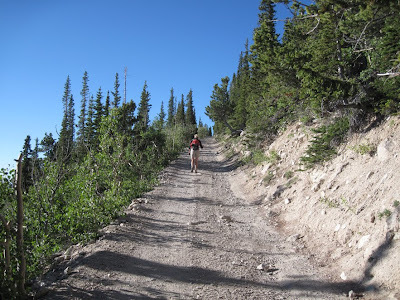 Princeton Road (which serves as the first part of the trail) to a set of radio towers located at 10,800'. 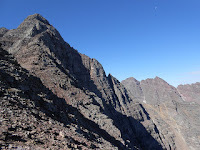 Gerry Roach's guidebook, Colorado's Fourteeners (the bible of Colorado fourteenering), offered this sage advice on this trailhead/approach: "There is a large parking lot at the bottom of the Mt. Princeton Road at 8,900'. If you value your vehicle, park here; this is the trailhead". We'd harbored a sincere hope that this advice was perhaps a bit outdated and overzealous, but once we reached this parking lot we discovered a large amount of cars and trucks, many with higher clearance than our humble Subaru, already parked, so we brought our car to a halt alongside them, tightened our bootstraps, and began the long, long, ascent. (We would later discover that most of these cars were not parked here by climbers but by attendees of a nearby dude ranch). The bummer of this base-assault technique on Princeton is that the approach becomes a 4.5 mile slog up a moderately busy 4WD road. Road approaches on mountains have never been my favorite. Four-wheelers, dirt bikes, and Jeeps kicking up choking clouds of dust makes for a mood-killing morning. As we hiked up this relentless road we were passed by many climbers (cheaters) blasting with their trucks and SUVs up the side of the mountain. I came to look upon these people with contempt, claiming to myself that we were here to climb the mountain, not drive up it. It is more likely, however, that I was merely envious of the several miles of tough hiking that they were spared. At 11,800' "Tigger Peak" (a 13,300' companion peak of Princeton's) loomed above us, and the route steered away from the long road at last. No more cars, trucks, or "cheaters". Only a switchback or two later, mighty Princeton appeared on the horizon. It was clear from this first vantage that Princeton truly is a monarch and a powerful peak. Not much farther, at 12,300', the rest of the route opened before us. Though it did not look far, it was a deceptively long, arduous climb to the top. The last mile and a half required careful, tedious route-finding through large boulders and loose talus. Concentration was mandatory with each step to avoid a slip. 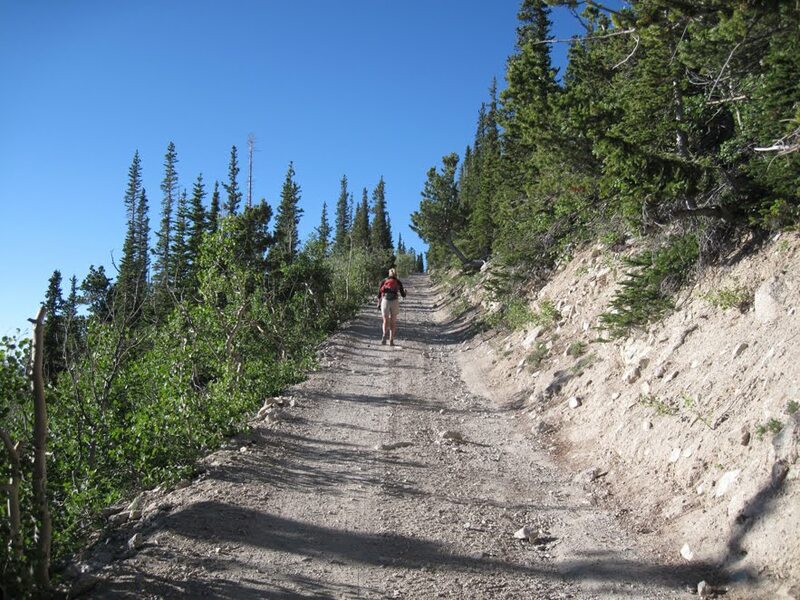 Above 13,000' the route became very steep and the boot-worn trail was analogous to a precipitous slip-and-slide of gravel ball-bearings. I often found myself frequently employing all four limbs for greater purchase. Starting to feel the benefits of having climbed nine mountains already this summer, however, we caught and eventually surpassed most of the climbers that had driven past us earlier that morning. Four and a half grueling hours after leaving the car behind at the trailhead, we were on Princeton's dramatic summit sharing congratulations with other climbers. One climber loudly claimed Princeton as his "21st fourteener". He added to this voluminous boasting his opinion that "all the mountains looked the same". The Prince was my 14th fourteener, and I couldn't disagree more. I found myself resenting his brand of high-alpine cynicism. Each mountain to me is as unique as the climbers who climb them. He refused to smile when we took his summit photo for him. Word reached the summit, passed along the climbing chain, that somebody had fallen on the mountain. 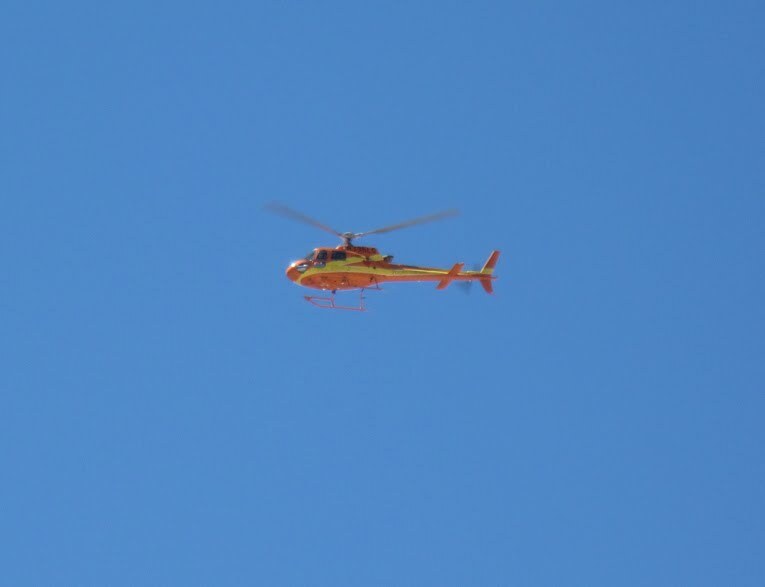 Almost as soon as we heard this disturbing news, a bright-orange Search and Rescue helicopter appeared and proceeded to circle the mountain for most of the remaining day. We could see the entire difficult portion of the climb from the top, and nobody appeared to be injured or in distress of any sort. As we descended we ascertained from other climbers still on their way to the top that a woman was claiming that her daughter had fallen. With understandable panic (had this actually been the case) she had summoned Search and Rescue to the mountain she thought she was climbing: Mt. Princeton. Unfortunately for everyone involved, she had made a major miscalculation and had actually been climbing "Tigger Peak" (Princeton's aforementioned companion mountain). 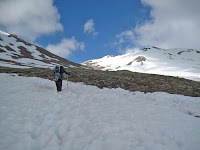 By the time we reached the bottom we had learned the full story: in the process of ascending the wrong peak, mother and daughter had somehow become separated. Panicked, the mother had summoned Search and Rescue. Nobody had ever fallen. Nobody had ever been hurt. 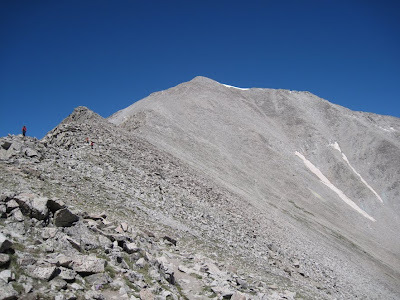 My conclusion from this strange event was that many people climb 14ers who do not take these mountains seriously enough. 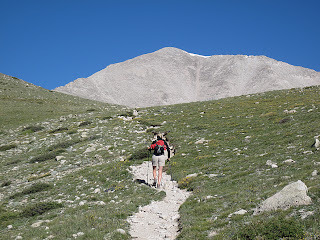 First of all, nobody should climb a 14er if they haven't done enough research to avoid ending up on the wrong mountain. Proper studying of topo maps and the numerous available guidebooks would have made such a miscalculation almost impossible. Secondly, Search and Rescue should not have been summoned unless there had been, without a doubt, an accident. 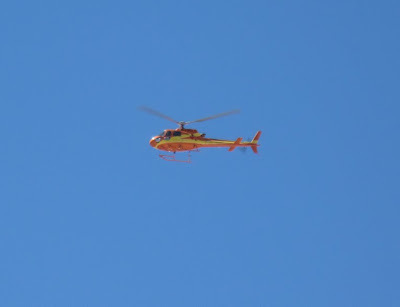 Ambulances, Sheriffs, a helicopter, and a Chaffee County Search and Rescue team a half-dozen members strong spent the better part of a day searching for a climber who was never in trouble in the first place. These hard-working folk might have had an actual emergency to attend to. This false rescue was a clear waste of resources. Though I was glad, of course, that nobody was injured, I was secretly satisfied with the knowledge that the mother-who-cried-wolf was likely stuck with a $10,000 bill for her mistake.